← Stray dogs and cats. I am here. 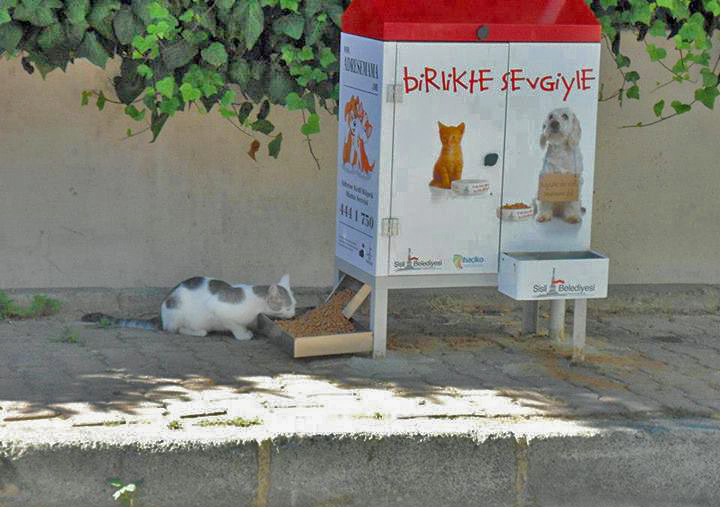 In Istanbul, someone is provided stray and feral cats – community cats – with customized dry food dispensers. I am not sure if the dispensers also provide water. “The Turkish people are known for their love for cats, and their kindness towards them.. The facility was specially designed to provide food and water for homeless cats and dogs 24 hours a day, 7 days a week. This idea is so blessed and beautiful. And it deserves recognition….” (Zina Michaelov on Facebook). Here is a photo of a cat using one of these dry cat food dispensers (Note: I have presumed there is more than one. Am I correct?). Also are these dispensers for cats and dogs? If so, there is no dry food that I know which is suitable for both. Dogs are more flexible with respect to food than cats. It might be pure cat food. Just a thought. Here is a video of Istanbul street cats. Istanbul is the largest city in Turkey. Will the dry food cat dispensers be around for the indefinite future? They might but I am not sure that they will. I wonder if eventually Turkish people will become more Westernized whereupon they may start to become irritated by community cats. I have never seen this sort of formal cat food distribution on the street. I believe it is unique to Turkey. Who is providing the food dispenser? Initially, I thought it was the local government but it may be a private organisation. This is one of the only times I have seen dry cat food used appropriately. It is able to last for a long time. As mentioned I wonder if water provided too? It needs to be. Dry cat food can cause dehydration and cats don’t drink enough water to compensate. This is one of the downsides of this cat food dispenser. It is still better than no food, obviously. What do you think would happen if there were cat food dispensers, on the pavement, like this in Europe, the UK or North America? Would someone vandalise the unit and steal the food? It may happen in Turkey for all I know. It would certainly worry me if I was involved in placing these feeders in a city. That said it is a very humane thing to do. It just needs to be part of a trap-neuter-return programme. This is the Facebook page and my thanks to Harvey Harrison for telling me about this. This entry was posted in Stray Cats and tagged cat food, community cat, Community Cats, dry cat food, human to cat relationship, stray cats of Turkey, turkey by Michael Broad. Bookmark the permalink. With so many communities seeming to go out of their way the kill and abuse cats in the most horrific way seeing the Istanbul cats has reinstated my faith in human kindness. A lot of countries could certainly learn a lot from Istanbul; living proof that we can live in perfect harmony with cats. Yes, it’s truth Turkish people love their cats a lot, maybe sometimes too much 🙂 In most of bigger cities you will see cat food and water just about everywhere but these food dispensers, provided by local municipalities, aren’t still very common. There are regular ”cat feeders’ here, so cats rarely feel hungry. Cats in Turkey look healthy but due to neutering (plus free food) most of them are severely obese. As you can see from a video. Cats in ıstanbul as well in İzmir are symbols of these cities. They are very lovely and most of tourists are impressed how sweet and friendly cats tend to be here. Neutering and spaying is getting overused here. There is a huge difference between now and a couple years before. In the past every house and garden or eating place got its cats and kittens. Today kittens are rarely seen. For all of these who forgot those cats are not homeless pets and strays! These are proud and ancient Anatolian cats! The longhair ones are called Angoras. So think about how can we neuter all of these beauties! They have a very important part in Turkish culture as well. Turkish people lived happily with cats and dogs for ages and prefer to see them outside – not in their homes however. Are westernized Turks annoyed by cats? No, they are not, but some of them particularly middle class women, became fanatics of cat neutering, re-homing or build new shelters. When they don’t do these they sit all day on Facebook sharing various stuff about cats. I see it as some kind of Obsession! Should we feed those cats everytime? Strangely we attract them more to cities (often in dangerous areas! ), providing them easy meal and after that we complain about the overpopulation? TNR will work, but is it a permanent solution? Would it be possible to relocated cats to safer areas away from cities? It’s hard to beat our habits to take care of every cats life. Sooner or later we start to think we own them, they can’t survive, will starve without us… Or won’t they? Do we really respect it as an animal or look at them as our children? I think the latter becomes more and more prevalent… Is it good or bad, I leave it for you to decide. Great comment as usual. Nice to have you visit again. Turkey seems to be a good place for cats. I never knew it was that good. Americans have never heard that said before! If only that were true in America. TNR obviously works if done properly (a lot). You seem to be saying that TNR is too effective and you don’t want the street cats to disappear. I like it that it is the local authorities who are providing the feeding stations. I really hope this lasts and has a positive affect. We could do it here – I mean it keeps cats out of people’s garbage and so on. In the US people have to do it covertly incase they get arrested and yelled at. I think the trouble with the west is people aren’t capable of thinking very far. They would rather keep killing cats for example, at greater cost. I’m sure they would diss food for cats in the street like this but they probably don’t like the cats because of scrounging thier garbage. I don’t have enough faith in humanity to think that 51% or more people like that would even be able to calculate that if the cats feed from a feeder then they wont tear apart their garbage – but I am synical to the extreme when it comes to ‘humanity’, which is a bad word by the way in my book at the moment. Mind-boggling, the amount of street cats on the pavement in Istanbul. I presumed the fish market of Worli in Mumbai was one of the rare places having a congregation of stray cats at one particular place.”P.O.C” has a video and a write-up on the same.Nice to know that cats are not persecuted in Istanbul and are allowed to lead normal lives with a little help from the city residents.Have passed through the Bosphorus sea and even docked at Istanbul for bunkering during my shipping years but never ever visited this beautiful city that straddles Asia and Europe, the bridge being a marvel.Istanbul seems to be one of the rare European city’s that doesn’t euthanize stray cats or dogs. Michael, i remember you stating once before that you drove to India in a bus in 1971 and i am again reminded of the same. What made you drive a bus from Istanbul to India in 1971 ? Was it a “Adventure Road Voyage” to raise some funds for charity as you do now for “P.O.C” ? Its something tremendous, a record to drive a bus from Istanbul to India by road.Please give us a brief idea of your amazing road voyage and the reasons for the same if you don’t mind revealing the same.I myself have become a nomad tourist venturing on “Solo back Packer” tours since i love the adventure associated with unplanned travel unlike “Packaged group tours”. i later blog the same for other tourists and travellers. Please , i would like to know or read about your 1971 bus driving tour across Europe and Asia, real mind-boggling. Actually I drove the bus from London to the middle of India! We just went through Istanbul. There were three drivers and we drove continuously. The idea was to promote the Commonwealth. Not sure I did that good a job though! I was filthy when I got back after 3 months travel. Our goal was to get to Sri Lanka but the monsoon stopped us. Everything was flooded. We got as far as Hyderabad. I remember the heat and the air conditioned ice cream parlours. I remember a dead man on the pavement and coins over him as a gift (I presume for the funeral). Nearly all the cats in Cyprus are community cats too. There are also lots of food dispensers for them but we call them restaurants. Cats at open-air restaurants are a major tourist attraction. Neat. I remember that. The cats become part of restaurant life. This is how people can deal with cats that don’t have a specific home. Make them part of the community. They can enhance it. However, there must be some people in Cyprus who kill cats (poison?). Not everyone accepts community cats. HOW BEAUTIFUL’ALL HEALTHY LOOKING .THAT WOULD NEVER DO IN A CITY HERE IN AMERICA.SOMEONE WOULD SURELY KILL THEM IN A SHELTER .MAY TRAP SOME OF THEM AND RELEASE BUT I WOULD COUNT ON IT.AND SOMEONE WOULD SURELY KICK OVER THE FEEDING STATIONS OR STEAL THEM. BUT WHERE ARE THE KITTENS?BLESS EVERYONE THAT HELPS ANS LOVES THESE PRECIOUS KITTIES.AMERICA COULD SURE TAKE A LESSON FROM THEM. Hi Nancy, thanks for visiting. Yes, I think there would be similar problems in the UK. The thing is this: in the UK we never see feral cats even though we are told there are lots of them. Strange. We have roaming cats but they are domestic. There seems to be a lot of community cats in Turkey, which makes this dispenser very suitable. Sadly I think you are right Nancy. What a shame. IT’s just a good way of organizing and helping the cats who are out there starving or looking elsewhere for food. If only people were kinder, or at least less selfish.